Love them or hate them (As a collector I just happen to love them) bootlegs typically provide the collector with content rarely given the time of day by bands, record labels etc. Buzzcocks, Magazine are no exception and as a huge fan of these bands I have to have my fair share. I will feature a number of these throughout this blog. My first is this early Buzzcocks recording with two shows both recorded in 1976. 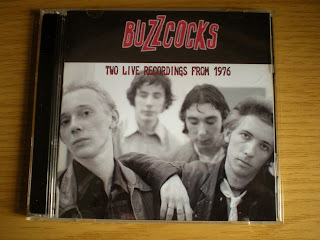 As you can imagine the quality isn't the greatest but nonetheless they are extremely important in the evolution of Punk Rock and the Buzzcocks and Howard Devoto. I wrote the only book on buzzcocks and during my research spent a night with Howard talking about the 11 gigs he did with the band. He was fascinating and in many ways strange. That must have been a very interesting experience indeed. Thanks for the insight.